Results in round 12 of the 2018 Theakston Nidderdale League season saw the title race blown wide open. Having lost only once all campaign, Helperby continue to lead the way, but a margin of just 20 points now separates the top five following defeats for the sides currently occupying second, third and fourth positions in the table. Despite an indifferent first half of the year, defending champions Ouseburn are right back in the mix after recording back-to-back victories, the most recent of which came against Burton Leonard. The 2016 and 2017 league winners emerged triumphant in the penultimate over of what was a closely contested affair after chasing down their visitors’ score of 244 with three wickets in hand. Half-centuries from Sam Crompton (72) and Michael Wray (54) had helped second-placed Burton put a more than useful score on the board despite 4-43 from Chris Morrison and three wickets for Dominic Snook. Adam Fisher (86) and Jamie Bryant (57) kept Ouseburn up with the required run-rate before skipper Morrison’s quick-fire 31 not out finished the job with 10 balls to spare. Just like Burton, third-placed Birstwith went into their clash with struggling Wath & Melmerby knowing that victory could see them climb into pole position. They were however stunned by their hosts, suffering just a second loss in nine games as Bobby Hilton’s team registered only a third win since promotion to the top flight. George Hirst struck a fine knock of 74, but Birstwith were dismissed for 148 thanks largely to the efforts of Hilton who claimed an impressive five-wicket haul. The Wath captain then completed a fine afternoon’s work by hitting 56 alongside Andrew Frost (34) as Wath made their way to 149/5. 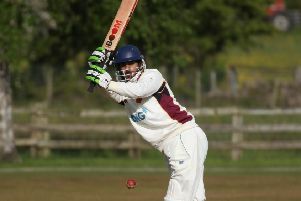 Darley were another side to lose ground on top spot when they failed to chase down Masham’s first innings total of 152. Bailey McCourt’s score of 56 was the highlight of that effort, Scott Clark causing all sorts of problems with 4-17 for the away team and Jordan King scooping 3-42. King (41) helped Darley get off to a decent start in response, but the rest of their batsmen failed to fire and they were sent back to the pavilion in the 41st over, 16 runs short on 136. Masham’ Craig Broadley (4-30) and Kieran Bramley (3-18) both played their part in ensuring that the high-flyers couldn’t knock off the required runs. Leaders Helperby extended their advantage at the summit to 16 points and piled more misery on Knaresborough Forest in the process. An excellent return of 5-25 from skipper Dan Marston and a trio of scalps for Joe Corner saw the relegation-threatened visitors skittled with just 107 on the board, Alex Knight their top-scorer with 25. Opener Joe Kinsella then hit 44 to steer Helperby to a routine seven-wicket win inside 28 overs. The one side worse off than Forest, Bishop Thornton, also lost again, suffering an 11th reverse in 12 outings. The Curlews were always up against it after a pair of century-stands helped hosts West Tanfield rack up a huge 311/6. Partnerships between star man Sam Able (111) and Brendan Miller (69), then latterly Jonny Luty (56), set the platform for a home success, while Nick Virr added a rapid 46 not out towards the end of the innings. Thornton were never in the hunt and only Steve Sowray (26) made any impression with the bat in the face of some masterful bowling by Luty (4-41) and Joshua Gericke (3-18). The basement boys eventually succumbed for 108, and a fifth triumph of the campaign for ninth-placed Tanfield leaves them 58 points clear of the drop zone. Dacre Banks secured a third consecutive victory after dismissing Goldsborough for 139. Earlier, Sam Mooney (94) narrowly missed out on a ton, but his knock, allied to 58 from Stephen Ellison and Stephen Wyss’ 52 got the away team to 267/5. Aussie Jarrod McPhee struck 49 when Goldsborough came out to bat, however support was not forthcoming and once he departed the hosts crumbled. Muhammed Khuzafia (4-40), Salman Sayed (3-19) and Waqas Rasheed (3-38) all shone for Dacre. Division Two leaders Pateley Bridge made the most of a defeat for Kirk Deighton, stretching their lead at the top of the pile to 17 points. The Badgers chased down hosts Studley Royal’s total of 121 all out for the loss of just three wickets, skipper Joe preece leading by example with a score of 48. Earlier, Luke Clarke had bagged 3-21 to help get rid of Royal, who were grateful to Steve Walmsley (54) for a defiant half-century. Second-placed Deighton came unstuck when they travelled to Killinghall. Dan Atkinson continued his fine form in 2018, plundering an unbeaten 116 as the home team made their way to 255/7. Gavin Mills (55) and Jon Watkins (38) looked in decent touch during the visitors’ response however a trio of dismissals apiece for Scott Copley (3-46) and Ben Atkinson (3-53) meant they got no further than 214. Their win leaves Killnghall fourth in the standings and breathing down the necks of both Deighton and third-placed Raskelf. 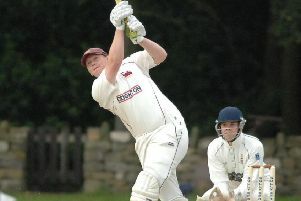 Matt Goddard’s troops made sure that rock-bottom Blubberhouses remain without a single success this year, restricting them to 150/8. Tom Davis’ 27 not out was as good as it got for the away side as Lindon Giuffrida, Matthew Burn and Stephen Burn each scooped a brace of wickets. Opener Barry Milburn then struck 48 to lay the foundations for a four-wicket triumph despite the efforts of Bash Khan (4-39). A run of five losses from as many completed fixtures has dumped Markington in the bottom two. An agonising seven-run defeat to Alne resulted in Saturday’s opponents overtaking them in the second division standings. The men from the Magic Circle compiled 228/4 with Tony Raper (117 not out) in stunning form and Ross Hardy (58) also impressing. Markington made good progress towards their target thanks to Wayne Dennis (50), Robbie Wilberforce (48), Tyler McGregor (32) and Dave Askew (30). And the visitors must have fancied their chances when they reached 220/8, only to lose their final two wickets for just one run. Raper rounded off a great all-round effort by taking four wickets, while there were three apiece for Jon Henley and Cameron Spence. Rejuvenated Spofforth made it three wins in succession, beating Scotton on home soil. Paul Fletcher’s 66 and Jack William’s 64 got the hosts to 258/7 as Blake Dobbin knocked over three batsmen. Scotton finished up 82 runs short in reply, however, Sam Halliday (35) their top-scorer while Ethan Westerman bagged 3-30. Burnt Yates climbed above Harrogate Strays and into eighth spot courtesy of a 31-run success. Jason Chyer (69), Dom Taylor (52), Chris Triggs (48 not out) and Ryan Lamb (46) all weighed-in for the home side in a first-innings that ended on 296/6. Tom Clark (56) and Toby Easthaugh (46) kept ‘Gate in touch, but they were to run out of overs as Carl Brockhill helped himself to four scalps.